As a Public Health student and wellness business owner I spend a lot of time researching how to live a healthier life. My research lately has been leading me to powerful benefits of adaptogens. Adaptogens are a classification of plants that help fight stress and help the body achieve homeostasis. There are various types of adaptogens such as ashwagandha, maca, moringa, and licorice. Recently, I discovered Superwell's Ashwagandha and was able to try it for free thanks to Superwell's Super Tribe program. 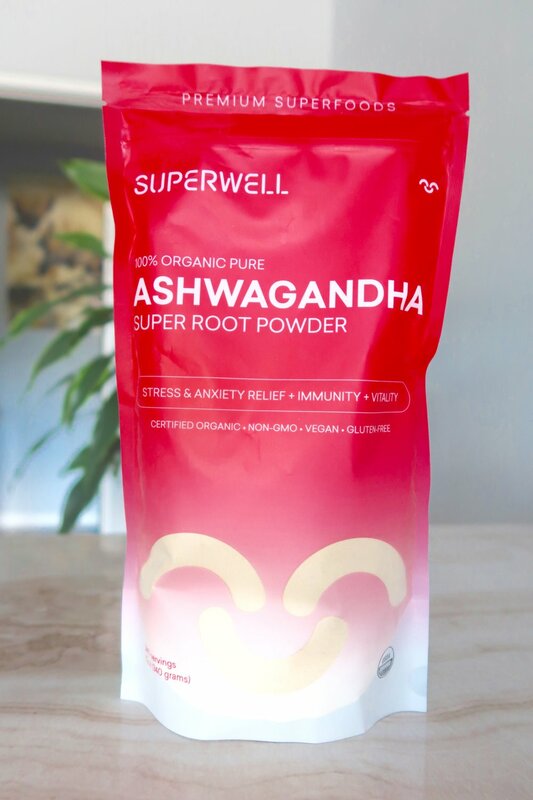 There are various companies that market Ashwagandha, but I am a huge fan of Superwell because of their company values and mission. Superwell is commited to providing the highest quality, organic, nutrient-dense superfoods grown with integrity, sustainability and ethical business practices. They also pledge 1% of their profits to providing life-saving vitamins to at-risk populations around the world. As a bonus their website if full of recipes and tips to live a healthier life. Add it to your smoothies, coffee, teas, soups, and various other dishes. I prefer to add 1/3 tsp to my smoothies. Warm the pea milk, then add the ashwagandha powder, cinnamon, and honey. Pour into your favorite cup and mix with a frother. Garnish with additional cinnamon and enjoy!